Krystal Reyes still looks so young in this gown made by Jot Losa. The one and only Marian Rivera gave this as a gift for her as it was worn last September 7 in a small gathering of friends and family at the 55 Events Place in Quezon City. Yes, she still seems so young and innocent... but she's already 18, it's time and she's definitely ready to face the world! 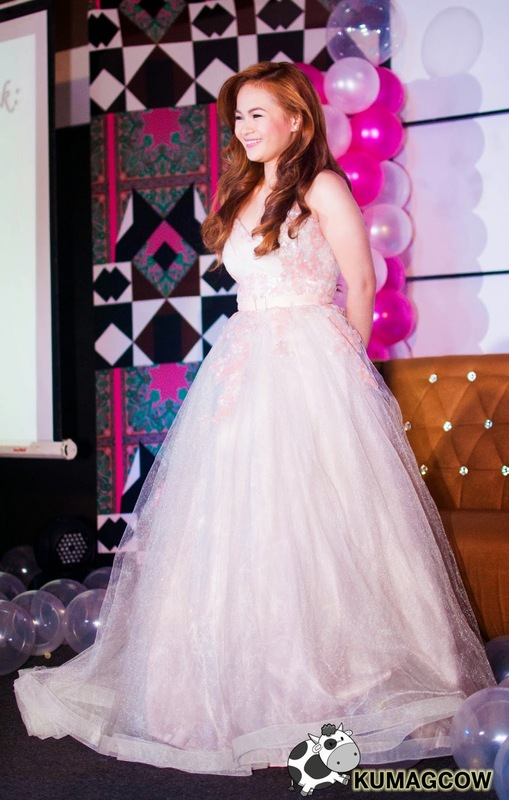 Her 18 candles was literally insane and star studded! Each one of them cried a bucket of tears and still remembers each program they were with on GMA. From Tween Academy, to Munting Heredera, to the reboot of Anna Karenina, to other projects and Carmela, they went on and reminisced how close they got as friends over the years. Some of them couldn't even talk because they were crying profusely. Most of them are really irreplaceable, they're not just good friends... they felt like family to her. They also treated Krystal as their little Sister. Then she came in too. Ladies and Gentlemen, the Queen Marian Rivera. Gorgeous and stunning, Marian Rivera shows how she loves Krystal. She did not only gave her that gown she's wearing but promised publicly that whatever help Krystal needs as long as Marian can give it, she says she should never hesitate to ask for it. She also wishes Krystal not to lose her innocence because that will be one important thing that will set her apart from her compatriots. That will also be a catalyst on how she will be on a personal level. Marian also wishes that Krystal would never change. Krystal is well loved, and there's a hundred or more reasons why. It's signified by the number of people who were there to say how much they love her. Good looking Derrick Monasterio sang a tune or two as part of the program. This also was the time where Krystal changed into her 2nd outfit. She came out in a Pink, very detailed top ball gown. I forgot to ask who did this but it was perfect for the next part of the program. The 18 Roses also included some hot guys on the list. Her Dad did the first dance. After a few celebrity guys and Krystal danced, this next guy got the most jeering from the crowd. Is there something special between Julian Marcus Trono and Krystal Reyes? Then for the last dance, Krystal got the cutest little guy from the crowd for the finale! It's Krystal's little brother. It was so cute to see them dance. That little mad held her by her side and did it like a man. Really cute! Krystal's Mom and her gave a speech after the festivities. She didn't want a grand celebration like this and wanted an intimate one in the beginning but it was a dream. This one came true and her most loved friends and family was part of it. She's very thankful for everything especially the people who made this possible. Sponsors like GMA Artist Center, 55 Events Place, La Corazon Restaurant, Fernando's Bakeshop, Islandrose, RRJ, Zanea, Nails Glow, I'am Shopaholic Mom, Papelito, Arts by Ayerie, AKD Kikay, Sweetness Overload, Ramski Photography (who made really great videos), Captureix Photobooth, Wackys Photobooth, MMC Couture chipped in to help this become one of the biggest and grandest birthday celebrations in Krystal's life. Krystal's Mom actually even cried. We had fun, she had so much fun and what's important is her happiness. Happy birthday Krystal! Thanks for having us during your 18th birthday!